Micky D's is getting a jump on a national requirement that big restaurant chains post their menu items' caloric content. 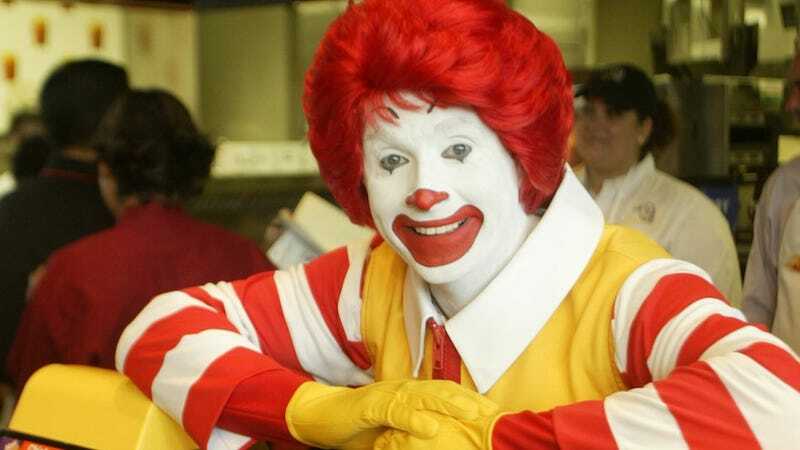 Starting Monday, whenever you walk, sashay, cartwheel, tap dance, mosey, crawl, or languidly roll beneath the golden arches, you'll be confronted by some cold, hard truths: single McDonald's food entres contain enough calories to choke the hearts of some medium sized farm animals. There are enough calories in a Big Mac to feed the entire cast of that reality show about neurotic girls who work at New York City art galeries for a week. The requirements are thanks to a lesser-known provision in the Affordable Care Act that mandates restaurants with over 20 locations to post calorie information so consumers can feel bad about what they're about to eat from the moment they order it rather than waiting until after they've licked all the buttermilk ranch dressing mixed with chicken finger crumbs off their plates. McDonalds' PR people are heralding their employers' decision to voluntarily "educate" their consumers as a magnanimous gesture by a company that just wants to give back to the country that gave it so much, but you bet your nuggets that they probably wouldn't be doing this if soon, everyone else would be doing it, too. The restaurant chain will be retooling its menu slightly as well, so that not every item has to have a skull and crossbones posted next to it (that's the international symbol for Will Give You A Heart Attack). They'll be adding an egg whites only McMuffin that they'll call the Egg White Delight. A larger version of the Chicken Snack Wrap will debut as the McWrap (which, if you say it fast, sounds unfortunately like "McCrap"). Other healthy menu items are also in the pipeline. Spokespeople for the restaurant claim they're not worried about the new information prompting consumers to make different choices about what they put in their faces, since nothing really changed in cities like NYC and Philadelphia where caloric information is already required. But as a person who is easily made to feel guilty, moving to New York only to find that my favorite fast food now came with a heaping side of "YOU ARE KILLING YOURSELF!" made me forego the occasional two cheeseburger with extra pickles and fuckload of fries binge. Which is probably exactly the rule's intention.